Quick post today :) I seem to be running out of Tuesday! Fishing anyone? 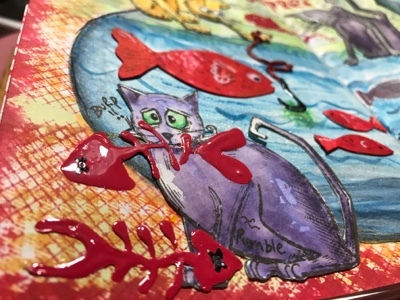 I do love my new feline friends by Tim Holtz :) Crazy Cats are such fun to play with! This was supposed to be mostly red but the cats decided otherwise! lol :) Posting to the next person tomorrow... hope they like it! Here's my whole page :) Its created on a double page spread in the Dylusions 5x8 journal. Next time I'll gesso the pages so the watercolours (Tim Holtz Distress inks) behave as they do on watercolour paper and don't soak through! The fishbowl was handdrawn then painted using Distress inks and markers, with the outline redrawn once everything was dry. The background is watercolour wash using Distress ink stains then stamped over using Darkroom Door background stamps (Chevron and Mesh). 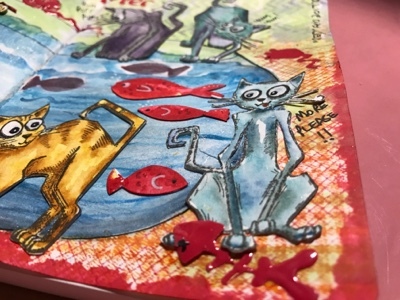 The Crazy Cats were stamped with black archival ink then coloured with Distress Markers. 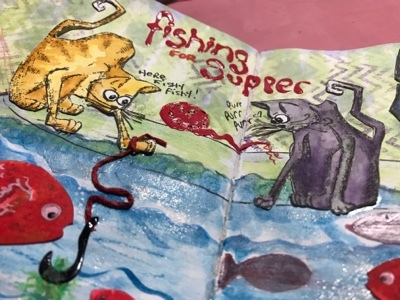 The mouse, ball of wool, fish bones and wording "fishing supper" were hand drawn using Ranger's Enamel Accents (it dries raised and shiny). 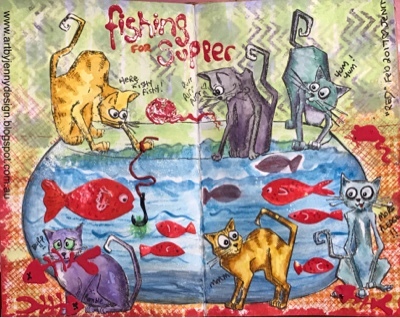 The paper fish were made from scraps of paper inked with Distress Ink Stains. All black and white details were made using my black and white paint pens by Dylusions. Grab your adorable cats (these are the big cats) and their friends here! Thanks for visiting. Hope these Crazy Cats and their antics made you smile!